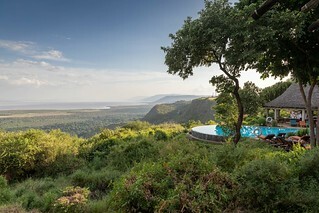 The infinity pool at Lake Manyara Serena Safari Lodge was perched on the escarpment of The Great Rift Valley, which runs all the way from Lebanon to Mozambique! It is a very visible geographical feature as you navigate your way through this part of Tanzania. You can see the hills of the escarpment fading away into the background here.